Home » SEG Blog » Winter Heating Tip! Are you closing your furnace vents to save money? This will actually INCREASE your bills! 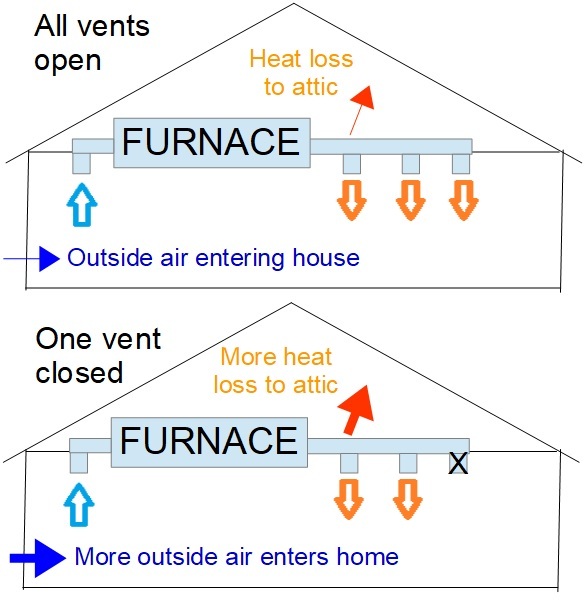 The picture below shows what happens when all vents are open. On average, ducts leak about 15% to 20% of the air the furnace fan pushes through the system (red arrow shows air leaking out of the ducts into the attic). That air is replaced by outside air coming in through little leaks between your home and the outside air (blue arrow). When you close off a vent you create extra back-pressure in the ducts, forcing more air out the leaks in your duct system which brings more outside air in through the leaks in your home that you’re paying extra to heat. Keeping your vents open is an easy, no-cost way for you to reduce your heating costs. This topic is just one example of what is covered in SEG’s free energy efficiency assessments. Assessments are useful, value-added services offered to all solar customers! By Ray Darby|2019-02-20T10:50:42+00:00January 13th, 2019|Energy Efficiency, Solar Industry/Technology|Comments Off on Winter Heating Tip!